In 1994, the first national robot competition took place in San Francisco. Competitors from across the country brought their radio-controlled creations made out of spare parts. 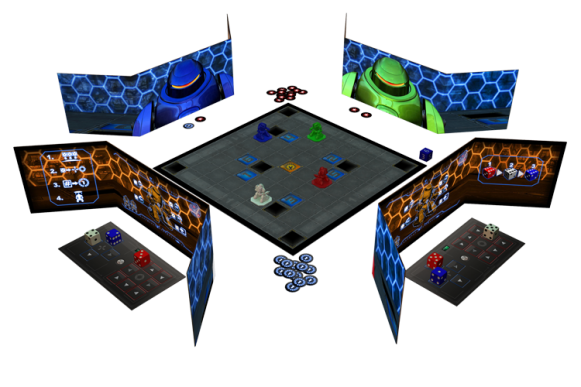 Several years later, the first televised robot combat competition was aired, which introduced the general public to the budding sport of robotic combat. Decades have passed since those early competitions. The robots have become more technologically advanced. The base of spectators and fans grew at an unprecedented rate. Large technology firms took notice and injected significant sponsorship capital into the sport. Prize pools for robot battles grew to dwarf those of other televised competitions. Professional robot operators gained celebrity status as their matches became the most watched sporting events in the world. The stakes are higher than ever. Do you have what it takes to step into the robot battle arena? VOLT: Robot Battle Arena is a tactical game of robotic combat. With easy to learn rules and engaging gameplay, VOLT is a game for both families and avid gamers. You must use your wits to out-think and out-maneuver your opponents to win! Be the first player to score five victory points. Players earn victory points by having their robot on the active control point at the end of the round or by destroying opposing robots. 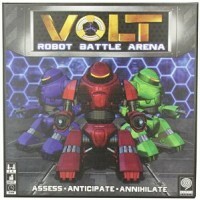 Add a Review for "VOLT: Robot Battle Arena"